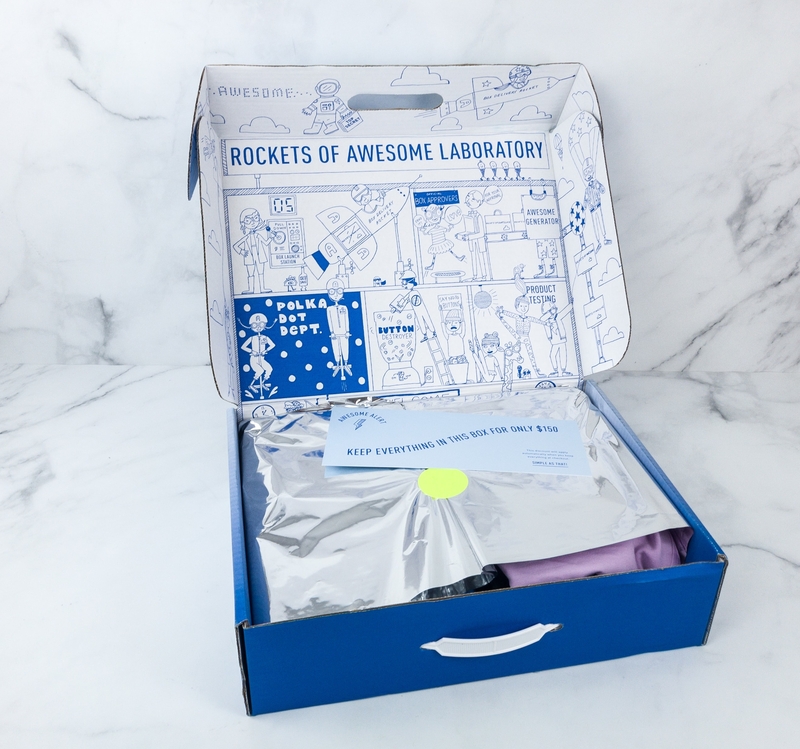 Rockets of Awesome Spring 2019 Subscription Box Review – Girls! 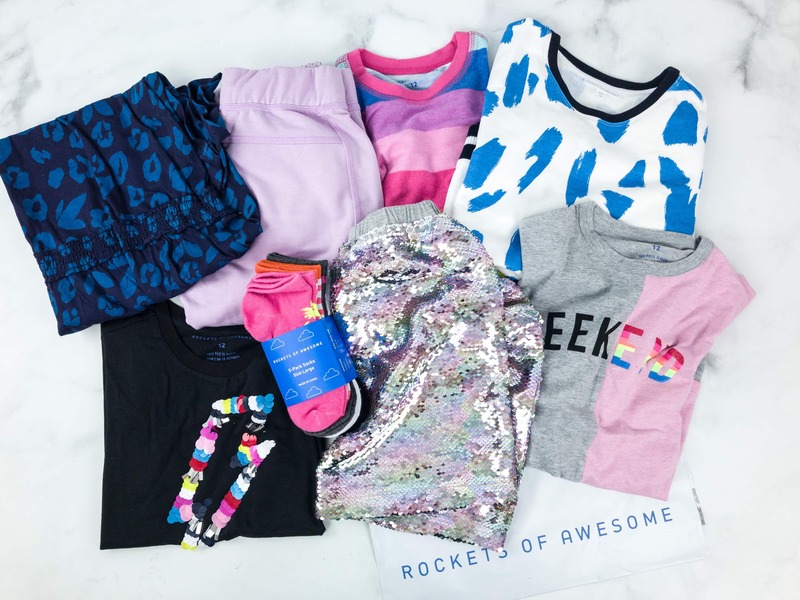 Rockets of Awesome is a quarterly clothing and accessories personal styling subscription box for kids. 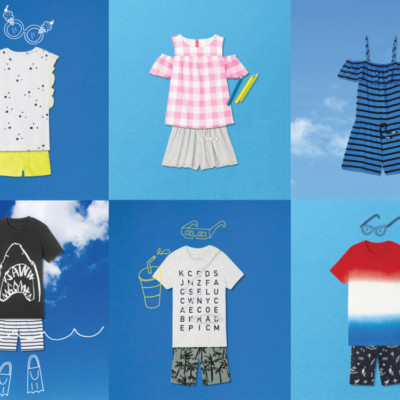 Each season, you’ll get a box filled with high-quality, stylish and comfy clothes. There’s no styling fee – just pay for what you’d like to keep and return the rest. Free shipping, both ways. 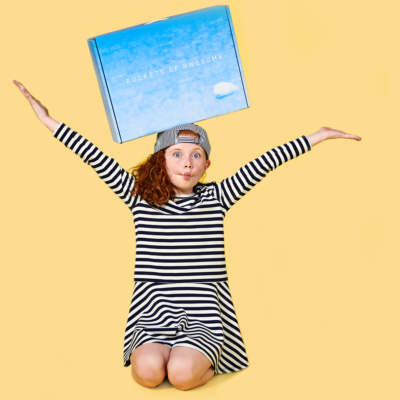 Boxes are available for both boys and girls. 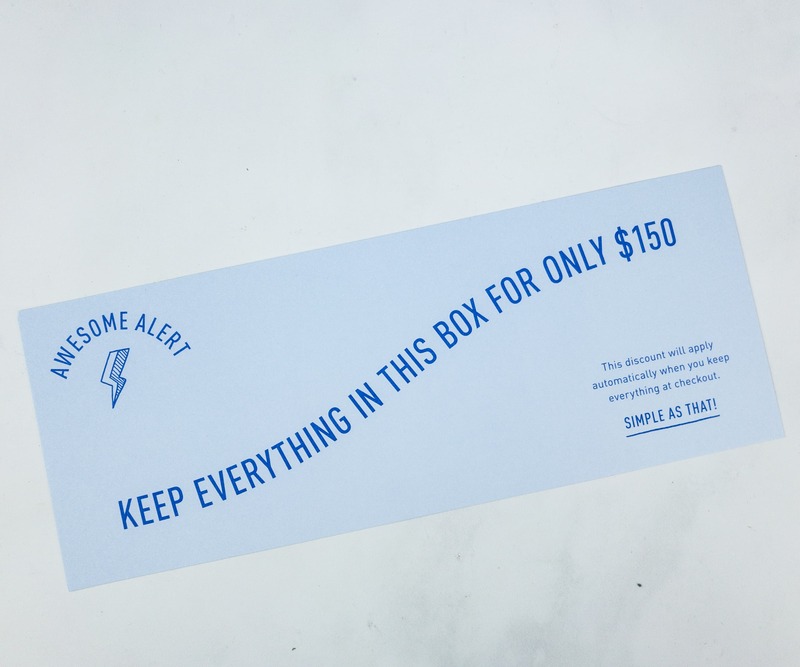 In every box, you’ll get 8-12 pieces, all from the Rockets of Awesome brand. Keep everything in the box for only $150! Discount applies automatically when you keep everything at checkout. 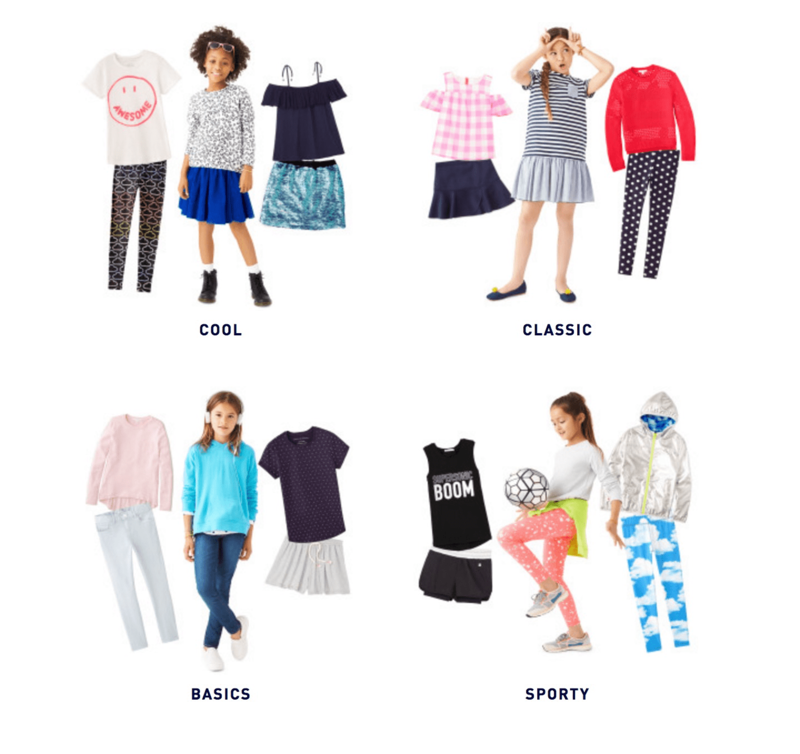 When you sign up you’ll answer a quick and easy quiz to help set your style preferences for your child. .There are cute doodles on the interior of the box! It includes an information card that reminds you of what you’ll only pay when you keep the entire collection. 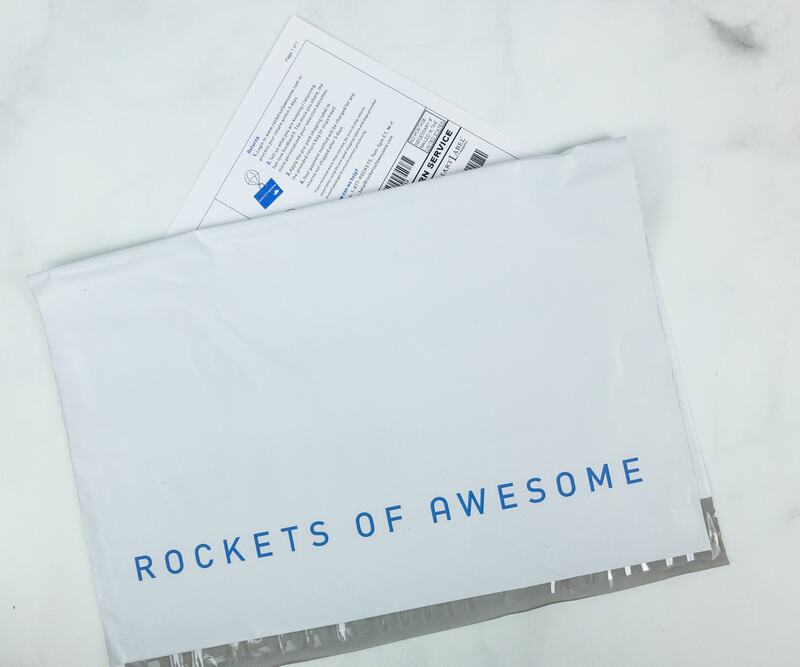 Rockets of Awesome has also included the return envelope in case you are planning on sending back items that you are not fond of. 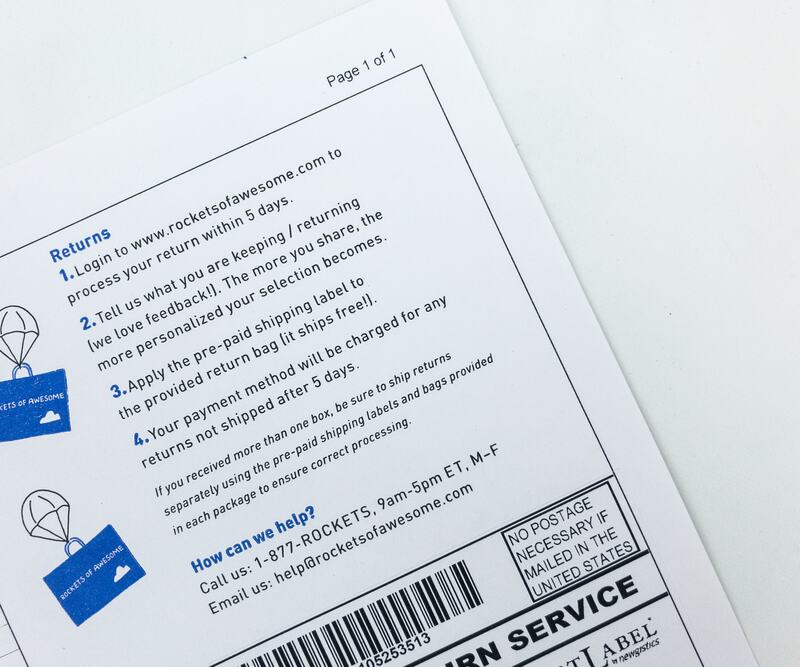 Instructions for returns are all indicated on the leaflet. The box is full and everything is neatly folded. 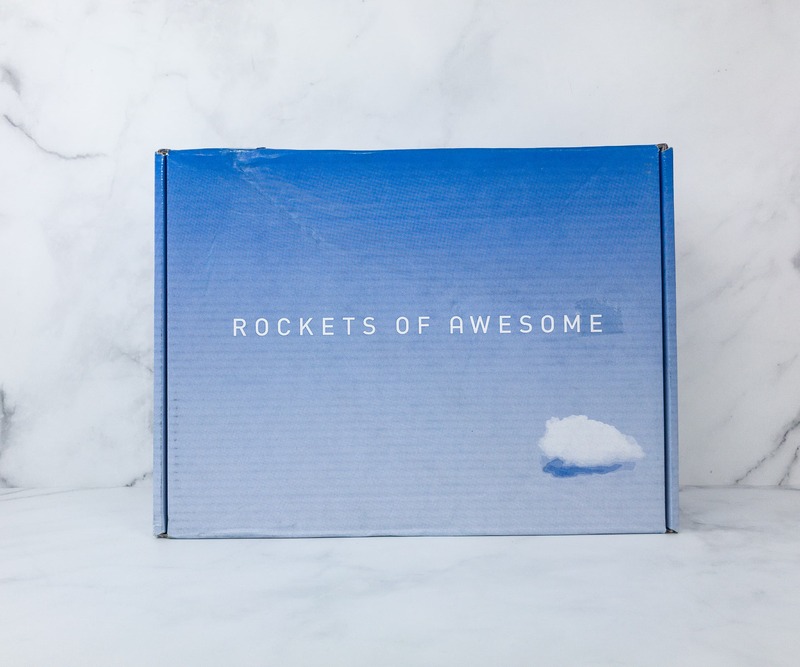 Everything in our Spring 2019 Rockets of Awesome Girls box! 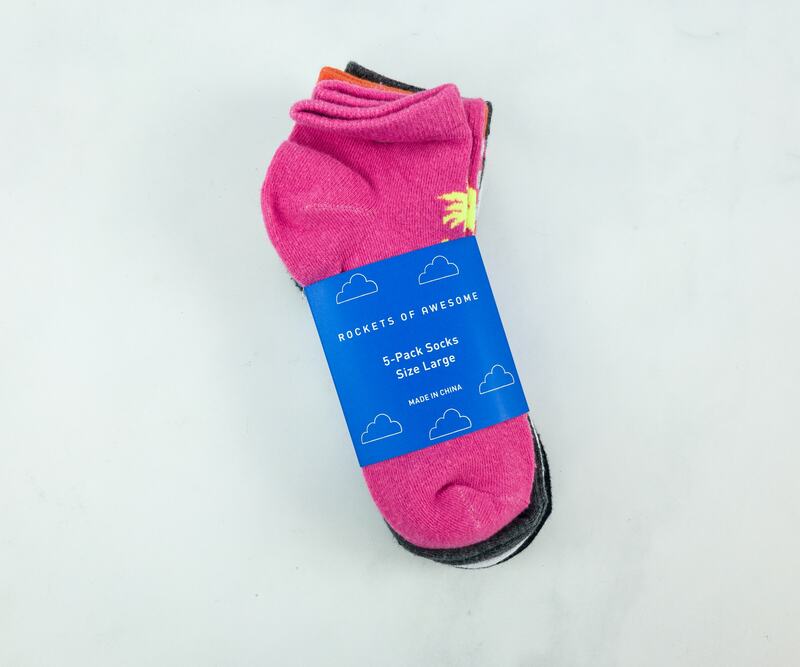 5-Pack Patterned Socks ($24.50; $16.90 if you keep everything) Socks are wardrobe essentials no matter what season. We got 5 pairs in this pack and they all come in large size. 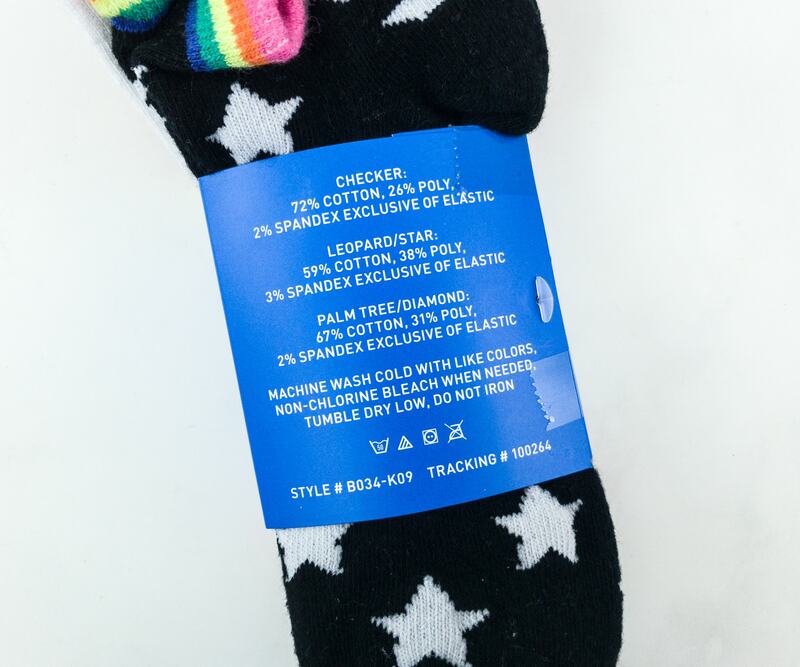 The socks are made of cotton, polyester, and spandex exclusive of elastic for enhanced fit from top to toe. They are also machine washable. 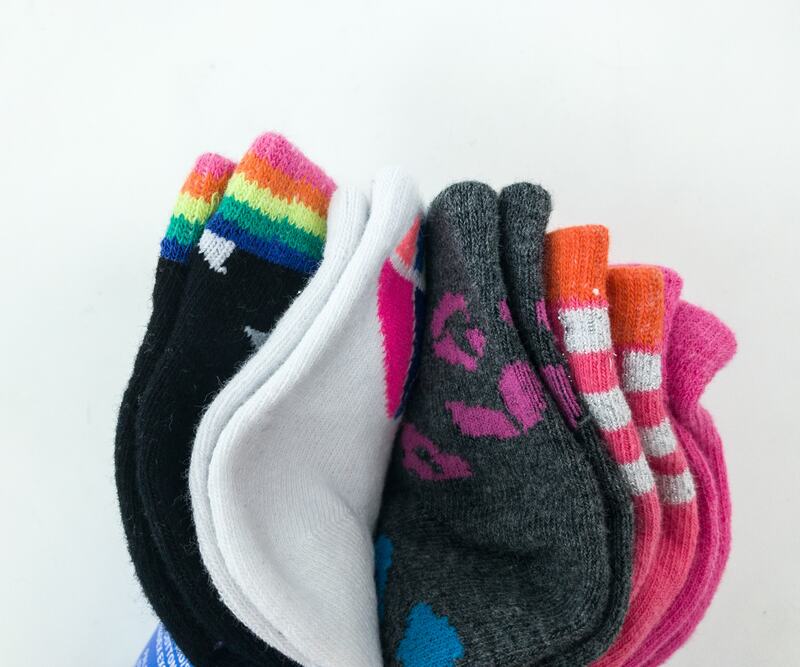 These ankle-length socks come in different colors with cute designs and ribbed cuffs. The toes and heels are specially reinforced for longer wear and less pilling. 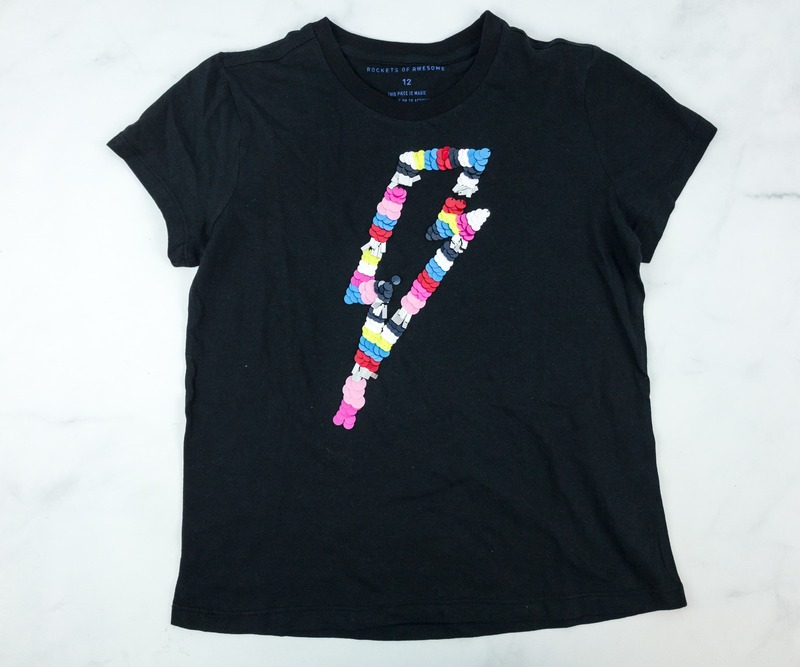 Embellished Bolt Tee ($24.50; $16.90 if you keep everything) The simple black tee was made elegant by the sequined details! 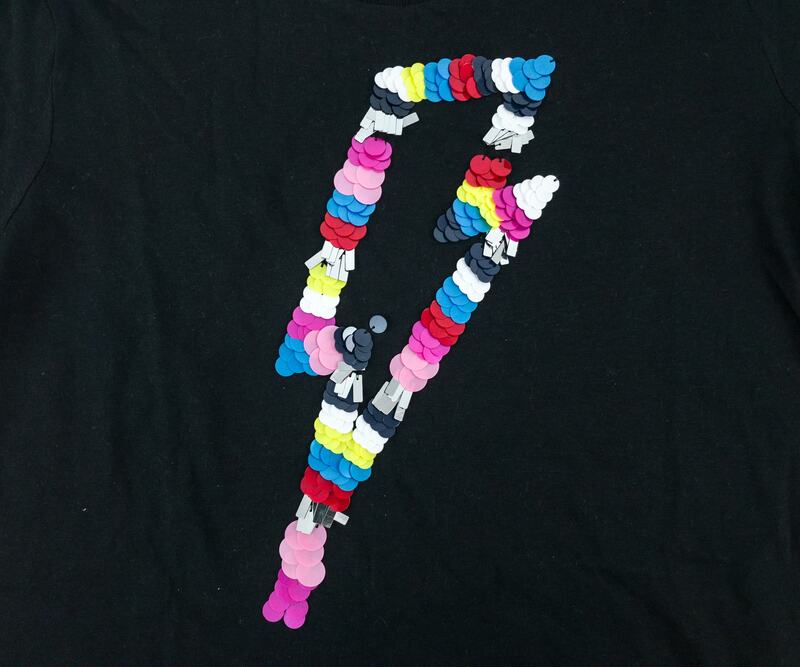 The sequins in different colors form a lightning bolt. It’s so cool! As you can see, it fits really nicely with my daughter’s body frame. The shirt is a good contrast with the sequined skirt which is also included in this box. 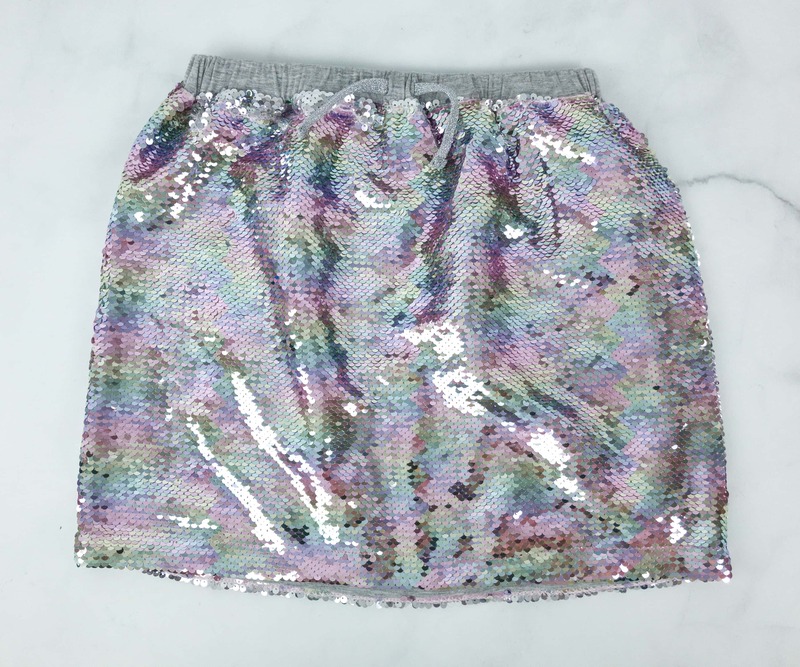 Flip Sequin Skirt ($32.50; $22.42 if you keep everything) What a cute skirt! 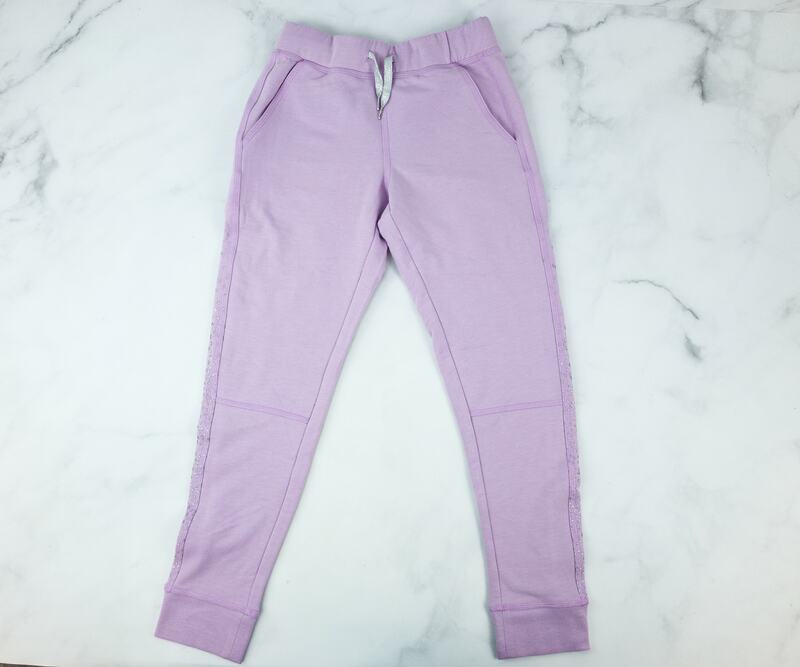 It’s knee-length, with a drawstring-adjustable waistband. The sequins on the skirt change colors with the swipe of the hand. It’s also lined and layered with a grey cotton fabric inside. It’s not too tight and not too loose, but just the right fit and shape that flatters my daughter’s long legs. It also gives that lovely mermaid-y effect that she loves! 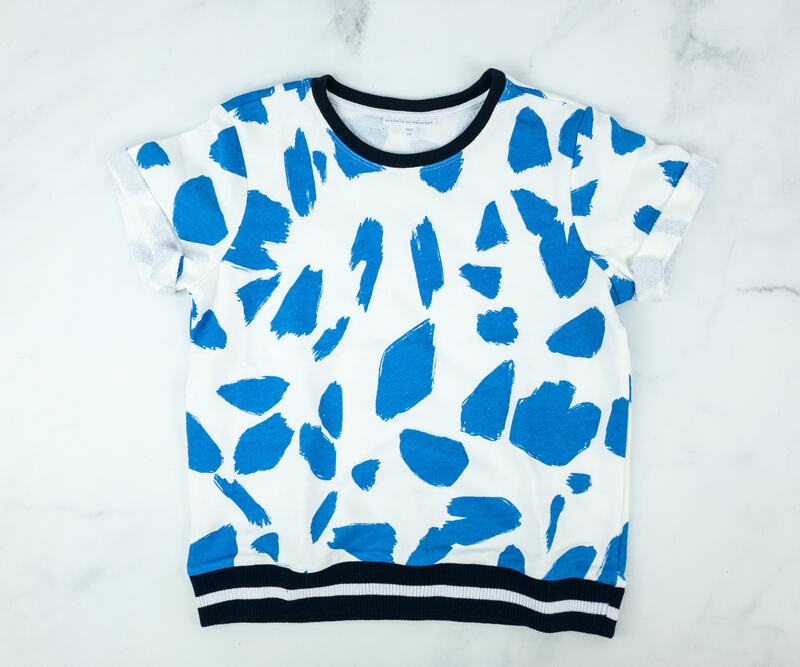 Varsity Printed Sweatshirt ($26.50; $18.28 if you keep everything) This shirt has breathable fabric that is cool to the skin and drapes freely on the body. The ribbed hem is also stretchable. It also has a round collar in black shade and the sleeves are folded at the tips which made them a good fit around the upper arms. 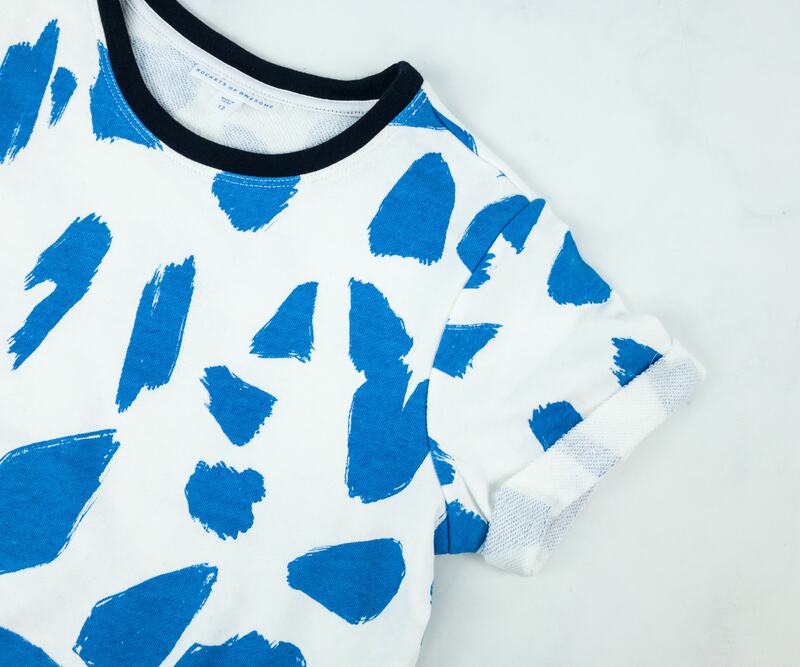 The blue paint streaks on white design of this shirt look like an abstract. It’s simple, yet interesting. 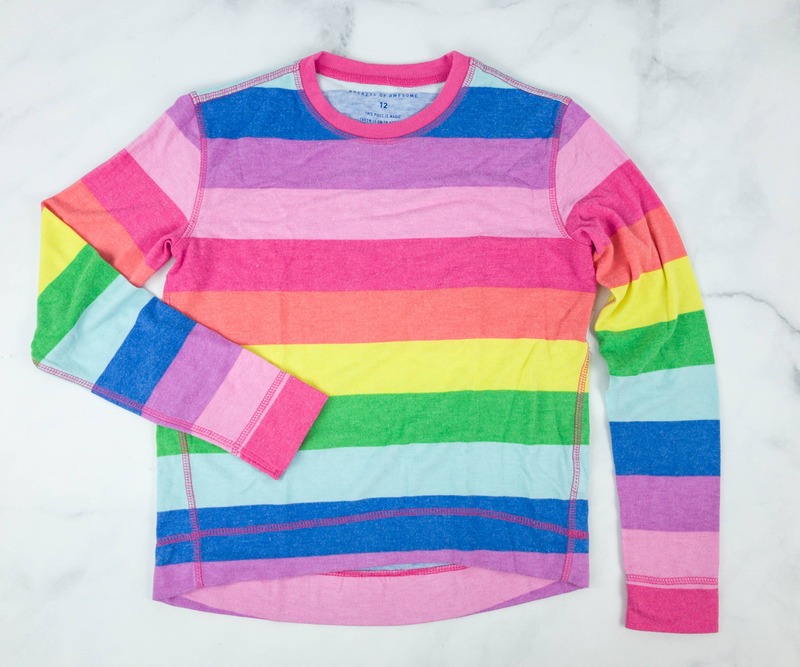 Rainbow Comfy Crew ($29.50; $20.35 if you keep everything) This comfy long-sleeved shirt in rainbow color is so vibrant and charming! 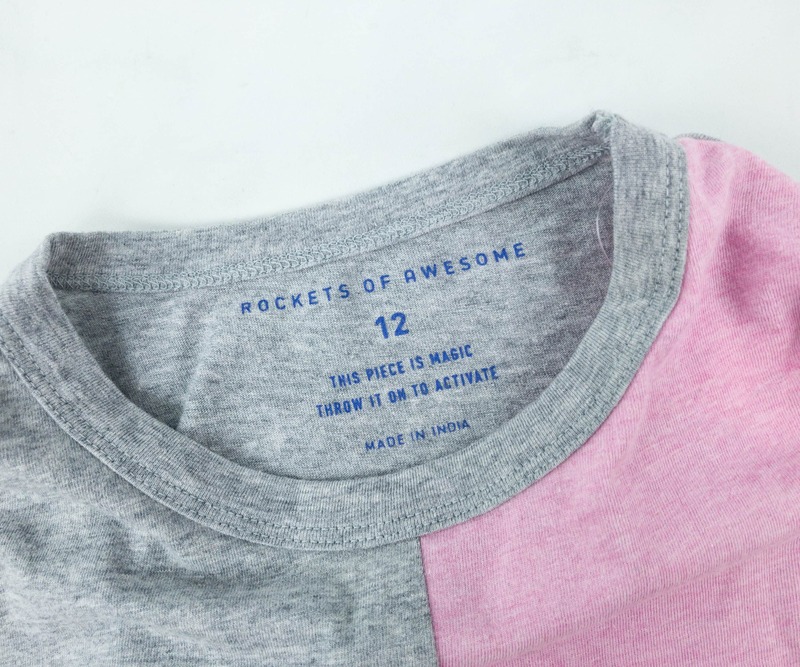 It has a relaxed fit with a crew neckline. 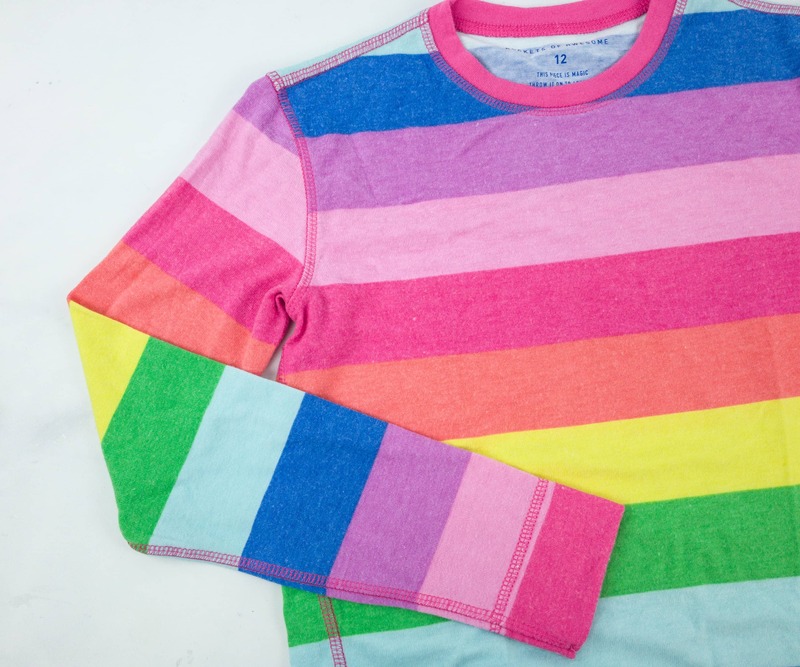 It can also be a pullover sweatshirt that is a good match for jeans, leggings, or shorts. 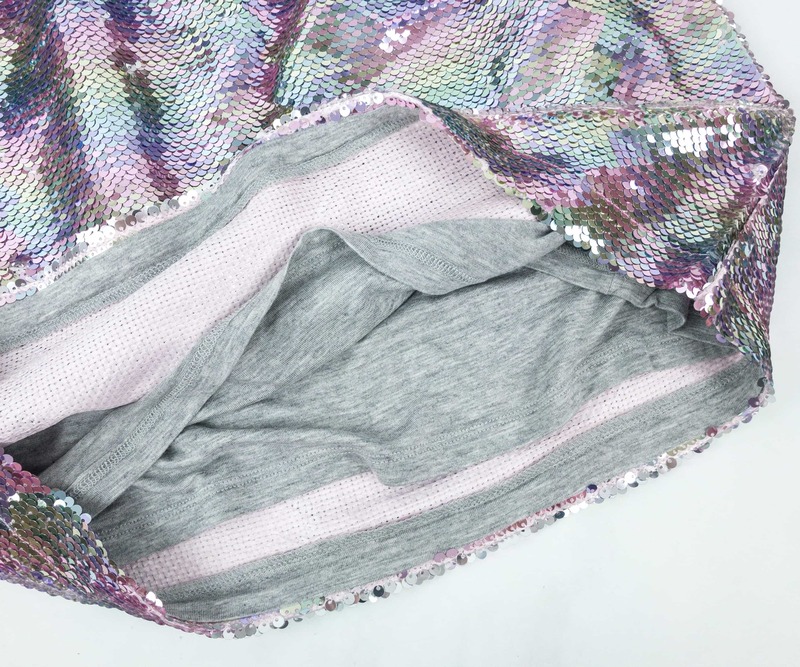 Sparkly Glitter Side Jogger ($29.50; $20.35 if you keep everything) Just like last time, we received a pair of comfy jogger pants. It’s in a different shade, but still as soft and pleasing to wear. 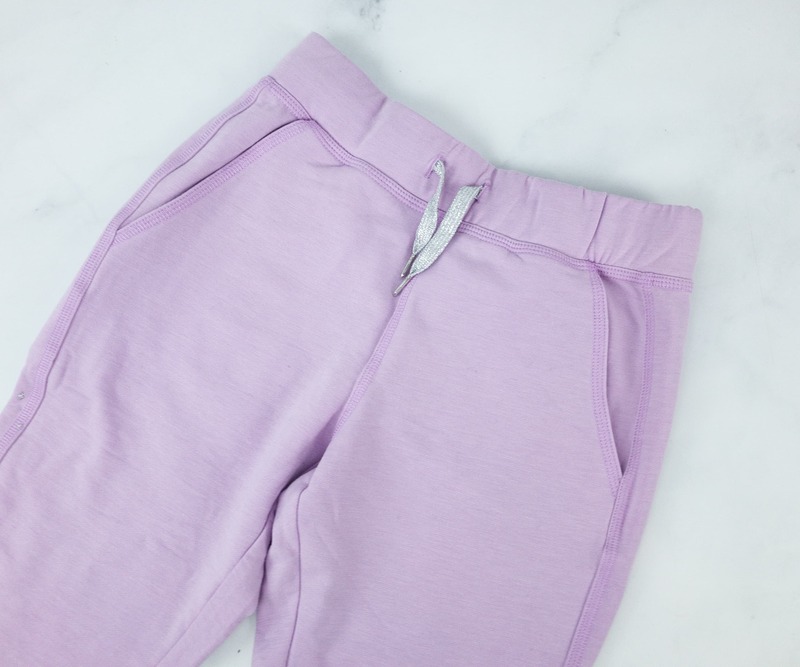 The elastic waistband is adjustable with a silver drawstring. It also has two side pockets which make it more functional. It allows my daughter to stash her elastic hair binder, extra coins and anything that can fit in it. It’s patterned with some glitters on the side for extra sparkle! 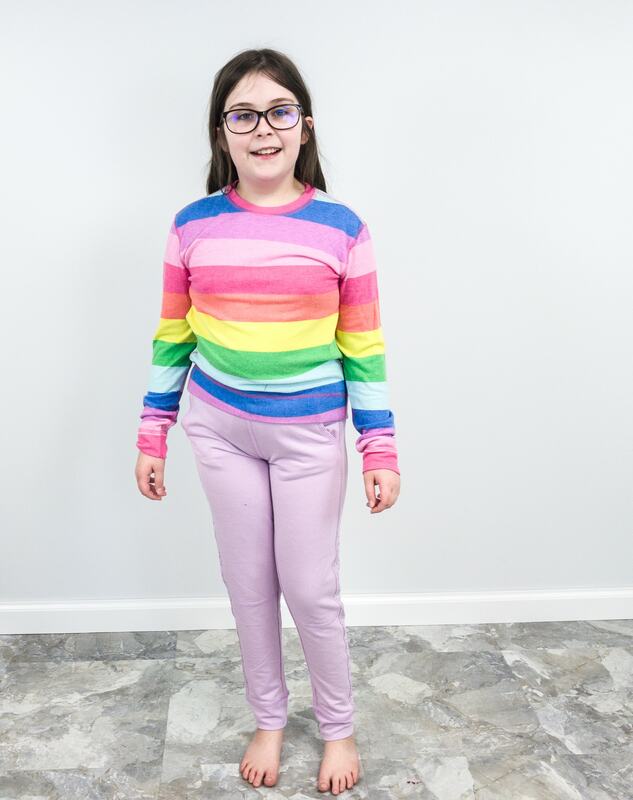 The rainbow shirt and jogger went well together because they both have that mix of festive colors that are refreshing to the eyes. This pair is as colorful as a bowl of fruit and my daughter looks so adorable in it! 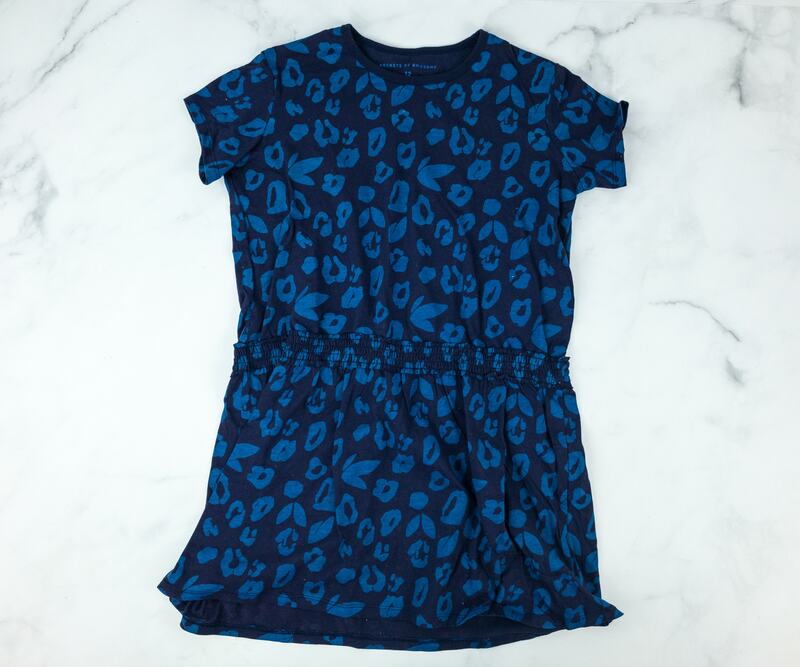 Drop Waist Leopard Dress ($29.50; $20.35 if you keep everything) This dress is cut to be fitted around the chest and waist, but loose at the hem. 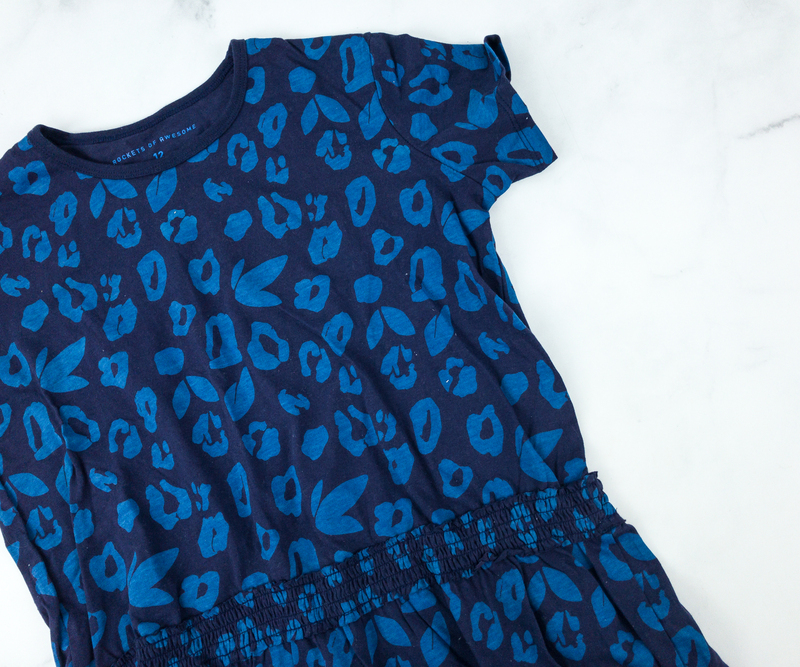 In a fabulous leopard print, this blue dress has a garter at the waist. So beautiful! 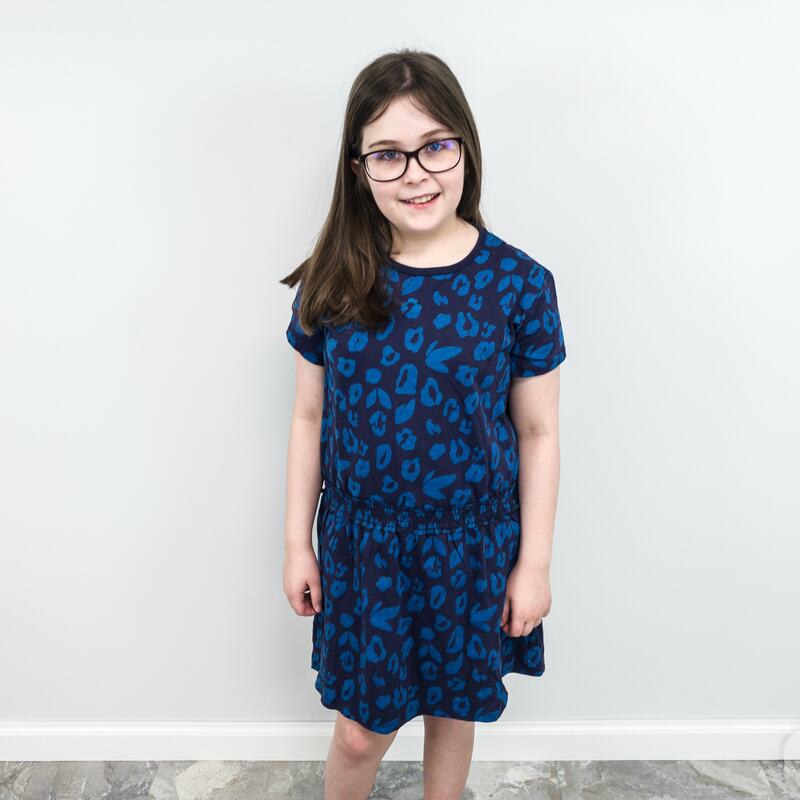 It gave my daughter a lady-like look that made me realize that she’s not a baby anymore. She also looks so confident posing in this dress. 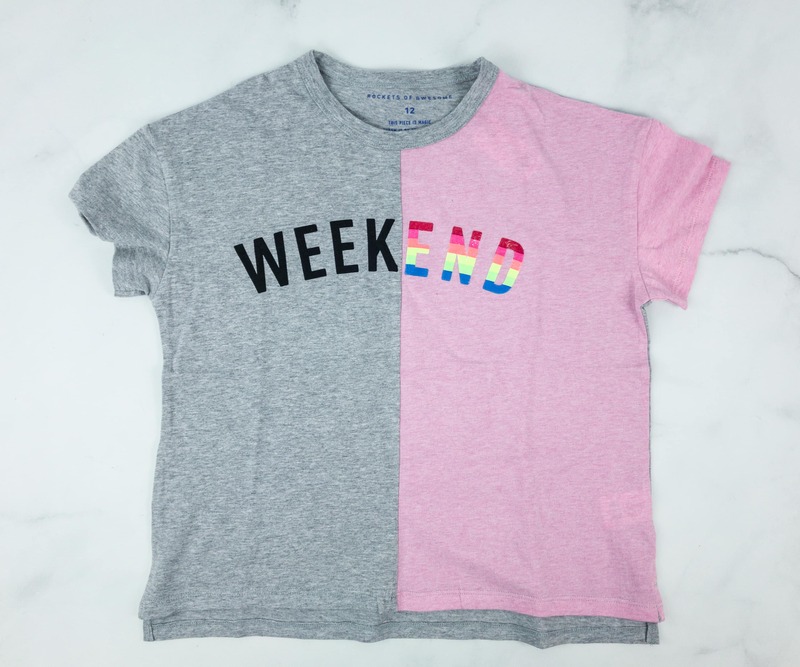 Color Blocked Weekend Tee ($22.50; $15.52 if you keep everything) This awesome shirt is designed with two contrasting colors parted vertically at the middle. 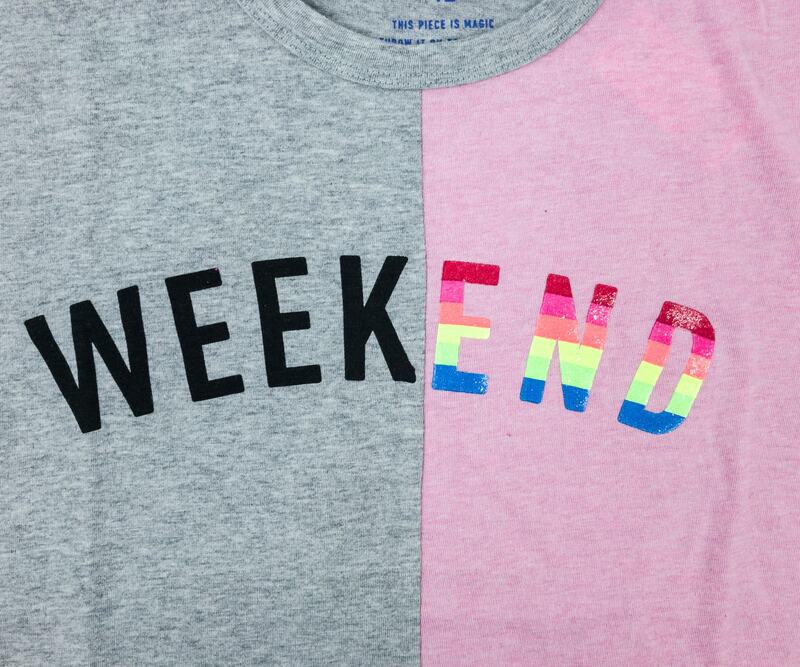 Even the syllables of the word “weekend” are color-coded too! It’s a quirky and fun design! 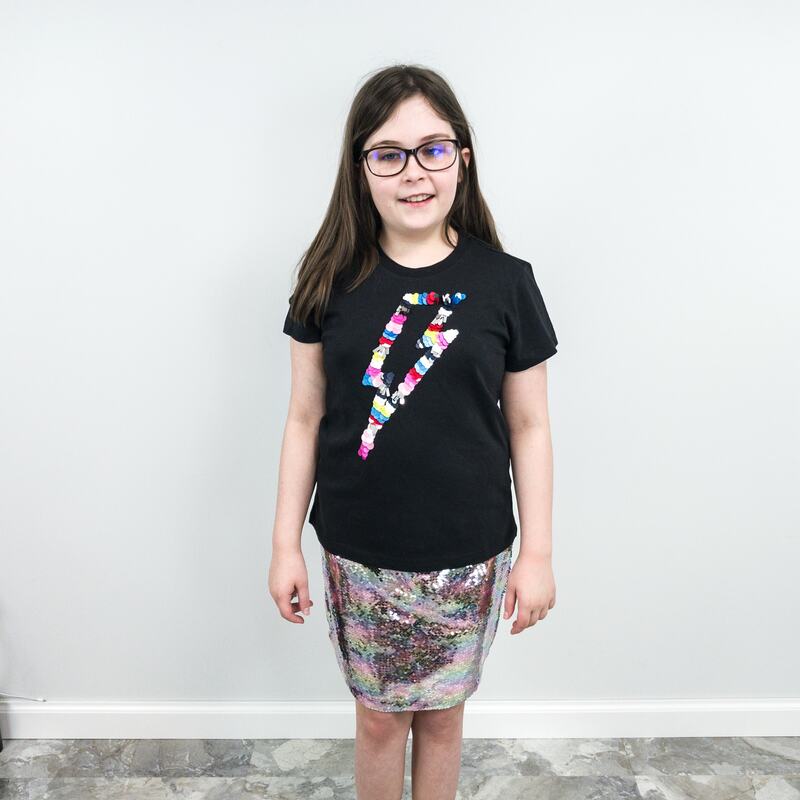 Evidently, the flip sequin skirt is my daughter’s favorite bottom piece because it can match almost all the tops in the selection. Absolutely stunning! 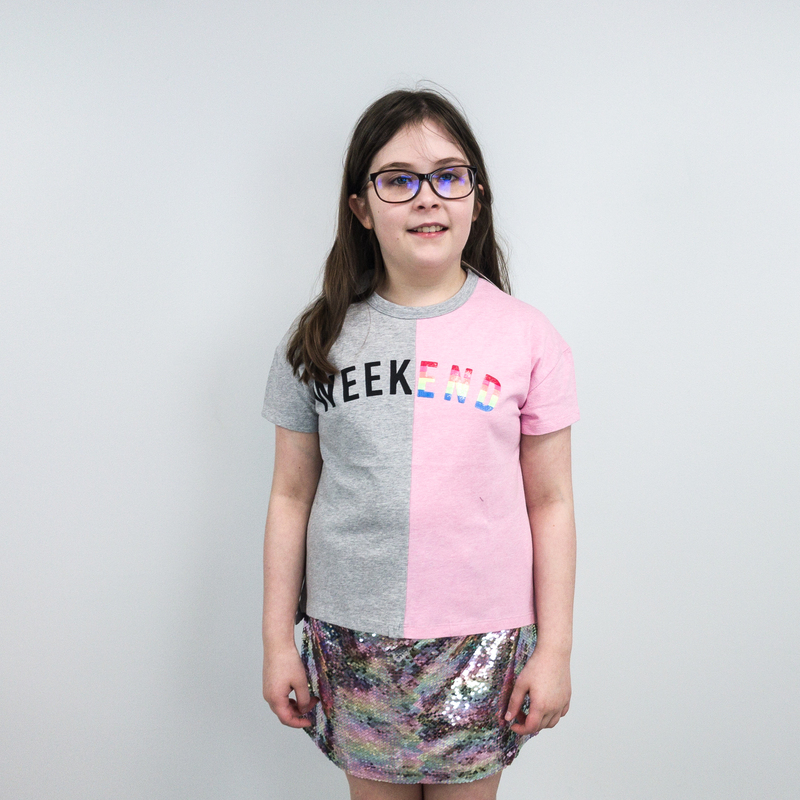 This box contains a mix of everyday casual wear, laid back weekend outfits, and a semi-formal ensemble which is pretty much everything my daughter needs for spring. 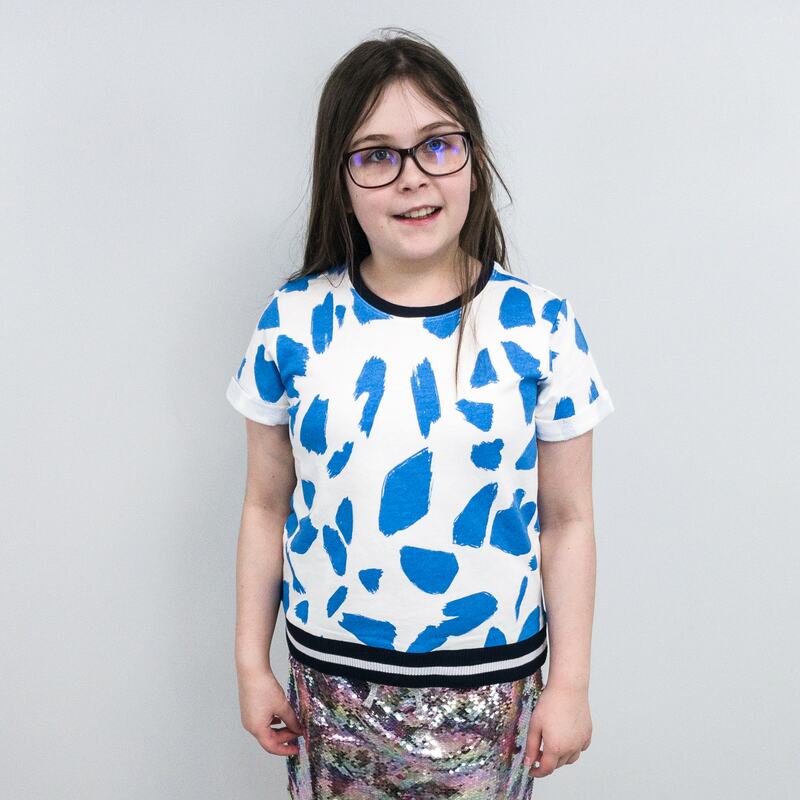 She loved all the items in this set, especially the leopard dress and the sequined skirt. She loves experimenting with her look and she’s so cute. I can’t wait to see her try more of these lovely pieces! 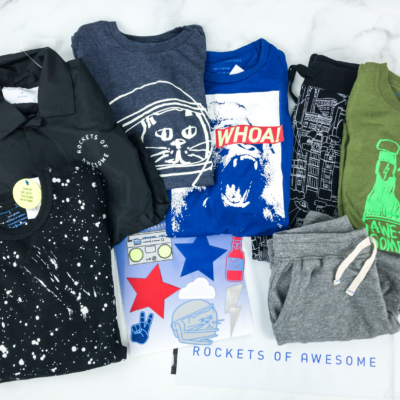 What’s your favorite outfit in this quarter’s Rockets of Awesome girls box?